Following the painful birth of the Irish Free State and the semi-severing of political ties with London, British currency remained the economic elephant in the proudly independent room. Though apparently ideologically irreconcilable, the Free State retained the use of Britain’s sterling until 1928 when the Saorstát pound (punt ) was introduced on a one to one ratio value with sterling. This attachment to the British pound continued after the introduction of the Irish punt in 1938. Both currencies, the punt and sterling, were based on the system of pounds, shillings and pence. The pound was made up of 240 pence, with 12 pence in a shilling and 20 shillings in a pound. That system had its origins in the Roman Empire and was associated mainly with modern British sterling and its linked currencies throughout the Commonwealth. A number of those Commonwealth countries had turned to a decimal system of currency during the 1960s and Britain itself made the decision to go decimal in 1966. The decimal system is based on one unit of currency and one or more sub-units, such that the number of sub-units in one basic unit is a power of 10. In the case of Britain, the basic unit remained the pound which was now made up of 100 new pence. Recognising the inescapably close economic bond between both countries, the then finance minister, Charles Haughey, announced in his 1968 budget speech that Ireland would follow Britain's decimal coinage system and go fully decimal on Decimal Day, February 15, 1971. Britain had already begun the introduction of some of its new decimal coinage into circulation. British coinage had always been accepted in Ireland, but what of the new denominations? The Irish Government issued its unequivocal ruling, "Neither the old nor the new British coins are legal tender here." But it muddied the waters by adding the ambiguous line, "their acceptance as money is entirely a matter for the public". It was an early taste of the confusion that could arise during the decimalisation process. In practical terms, the task of changing an entire system of coinage, preparing the public for such a change and physically recalling the old currency would be a mammoth endeavour. 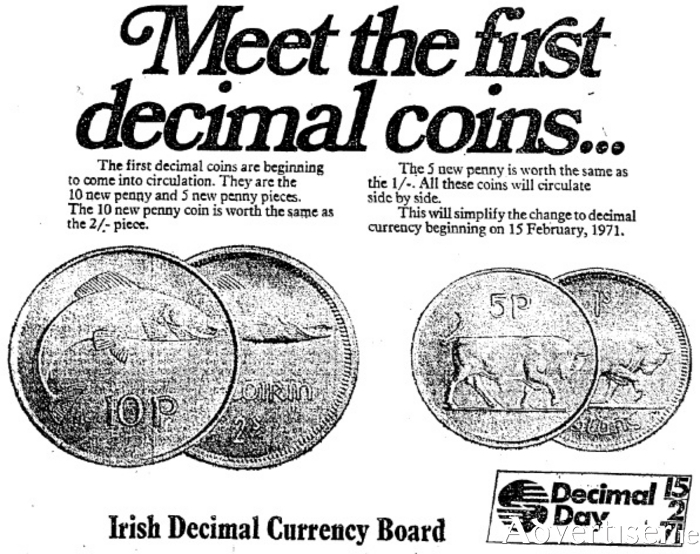 The Government had set up the Irish Decimal Currency Board to oversee the changeover nationally. The board released information booklets and dispatched members across the Republic to deliver public lectures focused on aspects of conversion. The board's lecture in Hotel Clew Bay, Westport, in late 1969, for example, was for the benefit mainly of local business leaders. Preparing the nation for decimalisation was not left solely to the government's new agency. As the months to D-Day decreased, vested interests brought their own information roadshows to the Mayo populace. The vaguely titled senior management specialist at the Irish Management Institute visited Castlebar to assist managers plan their effective changeover. FB O'Rourke, the well-informed assistant general manager of the Bank of Ireland group told a Junior Chamber of Commerce meeting in Ballina that decimalisation would have a major impact on everyday life. O'Rourke had spent time in Australia and New Zealand studying the effect of their decimalisation processes. He told the Ballina meeting that telephone boxes, postage stamp vending machines, postal orders, social insurance stamps, television licenses, and a host of other utilities would need to be modified. At another Chamber of Commerce information lecture, this time in Claremorris, a Bank of Ireland colleague of O'Rourke applauded the Chamber of Commerce movement for supporting the national decimalisation education programme. Most areas of Mayo were afforded some form of detailed advanced notice of the implications of the fast approaching new currency system. A Ballyhaunis meeting held under the auspices of the Defence Movement heard yet another Bank of Ireland manager state cold facts, this time for the ears of the farming community. The Belmullet Development Society held a similarly focused meeting in Erris and where specific meetings were not held, vocational schools offered free courses on the changeover. By the end of 1969, with a little over a year to go to D-Day, dozens of information meetings had taken place across Mayo and the Irish Decimal Currency Board had released its third information booklet. To gauge the public's comprehension of the change, a questionnaire was printed which included the question, "If a customer tenders four sixpenny pieces for an article costing nine and a half new pence, what change will be given?" Answers on a postcard please.